This listing is an add-on for your custom Print! 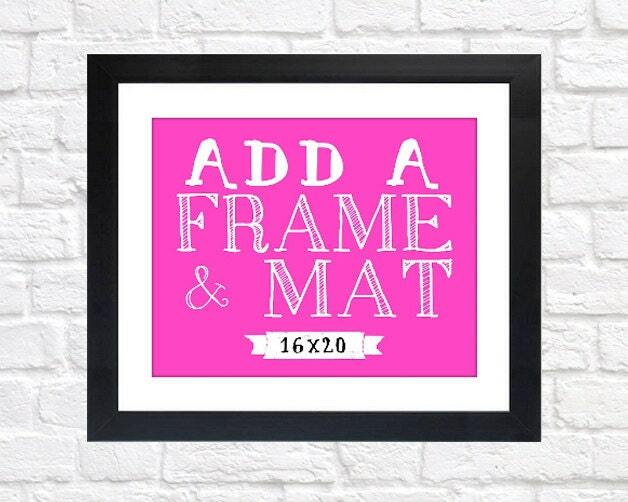 Add a frame and a black or white mat to your purchase! Item comes ready to hang, no need to worry about finding the perfect frame or mat, no need to worry about smudges or dust getting between your print and frame! Framing is completed in a Professional lab with gloves. Framing service is only available within the US. Shipping is $20 and will be sent via FedEx 1 business day. ♡ Choose your frame! See frames in Image 2 and descriptions below. - Add this to your cart along with your custom print purchase as well as your print size upgrade (So you will need a total of 3 items in your cart: The Print, the 16x20 Upgrade and the 16x20 frame). 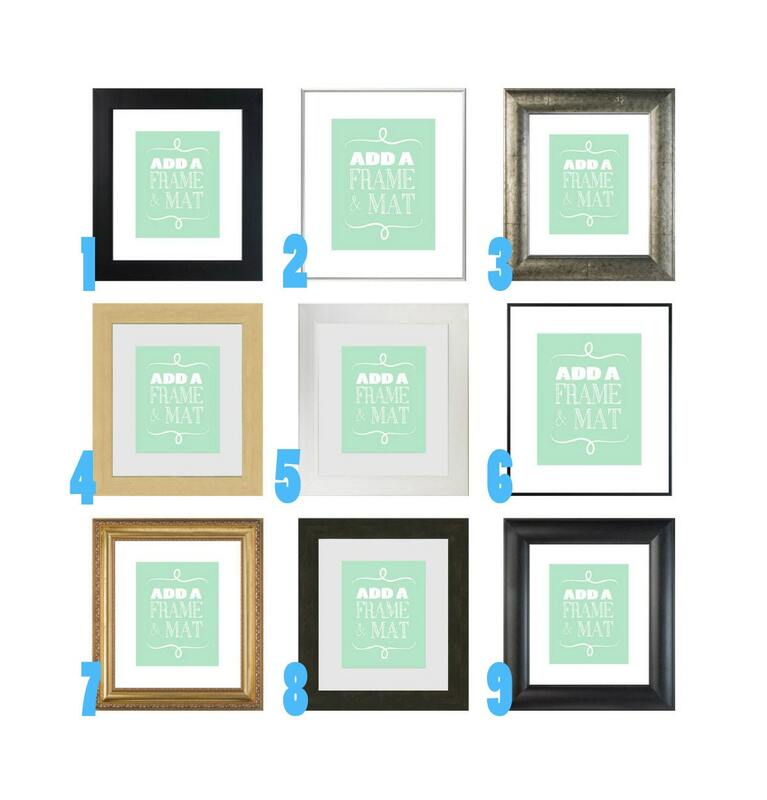 At checkout in the notes to seller, let me know which frame you would like and if you would like a black or white mat! Frame 1 - Minimalist Black: A simple, contemporary black frame that looks great with all interiors, especially modern or traditional! About 2” wide, flat and square. You choose a white or black mat, or no mat at all. Frame 2 - Skinny Silver: A simple, satin silver frame for those who want less frame and more print! Looks excellent with pewter and nickel accents. You choose a white or black mat, or no mat at all. Frame 3 - Silver Luxe: A striking, beautiful bold frame. About 2 1/2" slightly rounded moulding in a silver tone with streaks of black to add an elegant touch. You choose a white or black mat, or no mat at all. Frame 4 - Blondie: A gorgeous blonde maple frame. About 2” wide with a flat finish and squared edges, the Blonde Maple Frame adds a cozy, warm feel to any space. You choose a white or black mat, or no mat at all. Frame 5 - Minimalist White: A simple, fresh white frame. About 2” wide with a flat finish and squared edges. You choose a white or black mat, or no mat at all. Frame 6 - Skinny Black: A popular frame. Crisp matte black metal for those who want less frame and more print! You choose a white or black mat, or no mat at all. Frame 7 - Ornate Gold: A lovely Gold frame to add a traditional, romantic touch. You choose a white or black mat, or no mat at all. Frame 8 - Espresso Walnut: Add a touch of simple rustic sophistication with this dark chocolate colored frame. About 2” wide with a flat finish and squared edges. You choose a white or black mat, or no mat at all. Frame 9 - Black Luxe: Simple yet bold, this frame is elegant and suitable for all décor. About 2 1/2" wide. You choose a white or black mat, or no mat at all. All Prints are professionally printed, sized and cut. All orders will be shipped out within 7 days after your Approval. Please note that this item contains glass and cannot be shipped outside of the United States at this time. ♡ Please feel free to contact me with any questions you may have. I am happy to accommodate special requests. Every computer monitor is calibrated differently. Please note that the colors you see on your screen may be slightly different in print form. Please contact me with any questions you may have before you make a purchase. Thank you! will vary.